Every year August 4th is a day of celebration. our world of music with melody and rhythm that can never be dreamt of. This entry was posted on Thursday, August 4th, 2011 at 12:05 am	and is filed under Specials. You can follow any responses to this entry through the RSS 2.0 feed. You can skip to the end and leave a response. Pinging is currently not allowed. A Very Happy Birth Day to Gurudev KISHORE KUMAR……………. jine ki awaz ke karan hum sab log zinda hain! unki amar awaz ki vazaha se hum log zinda hain ! My all time favorites song is “ Phoolon ke rang se “-Prem Pujari (1970). Daily I hear his voice. My all time favorites song is: Phoolon ke rang se -Prem Pujari (1970). Daily I hear his voice. A Singer like him comes only once in 500 years or more than that. I am proud that I belong to that generation to enjoy his perfomance on stage and enjoy all those numbers that the Genius has gifted us with his golden voice. May his soul rest in peace. Happy Birthday to Mahaguru Kishore Kumar!! !You will rule till the doom’s day!!! Today on the occassion of Kishoreda’s birthday,one can find Kishoreda everywhere.Today allmost all the radio channels are paying rich tribute to Kishore Kumar by playing his songs and sharing anecdotes about Kishore Kumar.In Delhi,Big 92.7 fm has changed its name to Kishore 92.7 fm to pay tribute.In Kolkata,91.9 fm,92.7 fm,94.3 fm,fever 104 fm and 104.8 fm are playing 24 hours Kishore Kumar to celebrate the birthday of the greatst artist ever.Other fm channels like Radio Mirchi,107 fm,Fm Gold etc are also doing Kishore Kumar special shows.Tv Channels like CNN IBN,Taaza tv,Mohua News,Channel 10,R plus,24 ghonta,Star Ananda etc are paying rich tributes to Kishore Kumar day long.Some reality shows in Zee Bangla today like Sa Re Ga Ma are doing Kishore Kumar special episodes.In Kolkata,big function is being held in front of Kishoreda’statue in Tollygunge in the presence of many eminent personalities.In Bhopal,programme is being held.Jay ho Kishore Kumar Bhagwan Ki!!! kishore da very happy birthday to u.
Wishing Kishore Da a Very Happy Birthday. Happy Birthday to Mahaguru Kishore Kumar. He is my GOD. 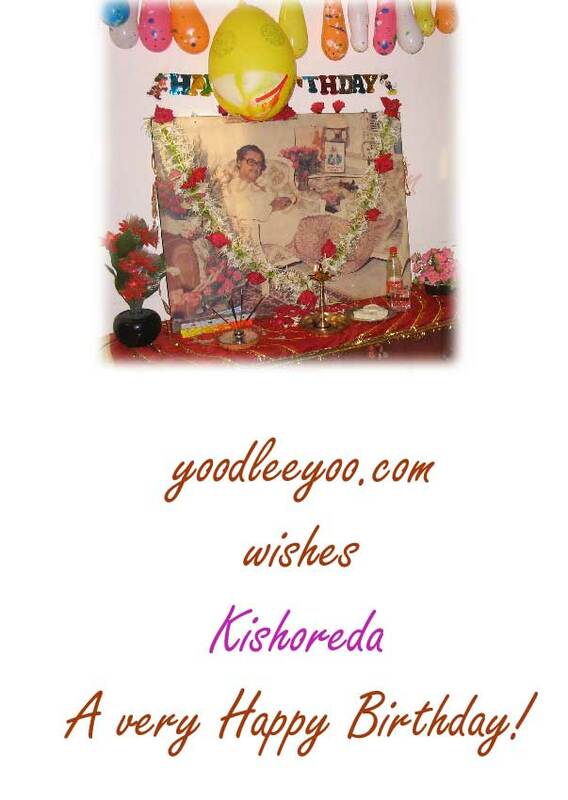 We are really blessed by Almighty that He given us the chance to here Kishore…..
Love U Kishorda :)) You Are the master of voice. I miss you so much & forever. Wish you a Verry Happy B’day!! Salute to The God Of Voice!! I will really pray kishore kumar like god . he is really gr8 or any world in any language or any litrature , even god also dont have any word to discribe his gr8ness of singing art . kishorda tumhari mahanata (singing) ye duniya sabdo me kaya taulege . ur realy gr8 . I can imagine my day without your song . I always feeling that kash i can meet to u . even I not born when u went . then also whenever I hearing your song I always feel he bhagwan kas is bande se ek bar tum mila dete . kishore kumar ne hindi filmo me jo gano ki sougat hame diya hai usaki koi misal nahi . even after his passing away people is very much like to hear his song chalte chalte happy birthday kishor da . my faverot of kishor da from do anjane sad verson luk chhup jao na o payare payare munne. Burapa me your songs are my only medications. kishor sir i realy miss u too much. kaash mein aapko mil pata aur live sun pata. mujhe lagta hai aap ka har song meri life pe suit karta hai. i proud ki aap ne humare desh mein janam liya aur logo ko jina sikhaya. i saluet u sir. I was lucky enough to watch Kishore da’ 4 live performances and the last one I watched him at LA in 1987. In his last performance, he touched evreyone’s heart by saying ‘ yadi jindgi rahi to fir milenge’ at it was sad that he did not come after that performance to LA. As if he had an intution that he wouldnt make it another time. I happened to meet him behind the stage and was very surprised to see him just sitting on floor with cross legs. He was very humble and genuine person. God had gifted him a golden voice and he was the only singer whose voice quality remained intact till his last breadth. As i write these comments by eyes get full of tears…. Remember true maestro, the legend and a versatile artist – our “Kishoreda” on his 83rd birth anniversary today! yoodleeyoo!!! I live and grown up with his songs……..no matter what the occasion is, his songs made me enjoy the life!! Happy birthday Gurudev 25 years you are still the undisputed king of the music industry and will remain forever. Happy 83rd bday to Kishore Kumar,admin please publish a new topic on Kishoreji’s bday today! Happy Birthday Kishore Da! Aap ki yaad to hamesha rahegi par aapke amar geeton se us kami to poora karne ki koshish karte rahenge. Aapka janamdin to saal mein ek hi baar aata hai, par hum to roz hi 4 Aug. ko jeete rahenge…. Happy Birthday Kishore da ! There has never been a single day in my life right from childhood that I have not sang your song. I am a die hard fan. I have stayed in Mumbai but never got an opportunity to see you. Wish you were there for one glimse. Your mesmurising songs will always stay in my heart. Being a bengali AAR KI BOLBO, SHOODHU AAPNAR PRESENCE TA MISS KORCHI. Love you Dada ! Mr, Kishor Kumar You Was A Such Great, Beautiful, Melodies, Romantic Perfact Singer………..
Kishore Da was a synonym for versatility, he did every possible job in the industry – playback singer, actor, lyricist, composer, producer, director, screenwriter and scriptwriter and won awards in most of these categories. Impossible to slot, inimitable and incomparable he lives forever in the hearts and minds of music lovers. I salute the God ! !